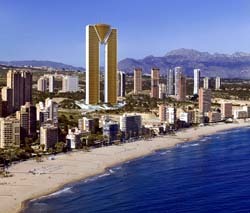 The presented room availability, rates and discounts are actual and final for all our 265 hotels in Benidorm. Another interesting holiday is celebrated on March 17. This is St. Patrick's Day. Many people also call it the day of Irish culture. During the holiday the local residents dress in clothes of green color and cook Irish dishes. In the afternoon various costumed processions are organized in the city. The local bars and pubs also prepare a special holiday menu for its visitors. For example, visitors can try a special green beer only during the day of celebration. The next day, March 18, is widely known as a celebration dedicated to the arrival of spring and is called Las Fallas de San José. If St. Patrick's Day is a small scale holiday, the spring festival is always marked by massive folk festivals and celebrations. In order to welcome the long-awaited spring, the local residents construct huge figures made of cardboard, and then they burn them on the squares of the city. March 18 is always the time for various fairs and cooking contests. In the evening everyone gathers on the main square of the city in order to admire a spectacular pyrotechnic show. The celebration of Day of Moors and Christians (Moros y Cristianos) is a no less striking event. It is usually celebrated in the first half of October. The celebration lasts seven days, during which visitors of the city can become the attendants of interesting street performances, music concerts and special events for children. This is the way the locals celebrate a memorable event - the expulsion of the Moors from the country. Everyone is welcome to participate in the colorful theatrical performance. All you need to do is to purchase a carnival costume, and you can take part in festive activities. Widest choice of candies and other treats is a mandatory attribute of the holiday. You can purchase delicious food in numerous street cafes.